FFA - Terror-linked Council on American Islamic Relations' (CAIR) history and agenda. Here's why millions of Americans are concerned about the Council on American Islamic Relations (CAIR). Council on American Islamic Relations' officials have been sentenced to prison and/or deported for supporting terrorism. CAIR leaders proclaim support for Hamas and Islamic imperialism over the United States. In 2007, the United States Department of Justice named CAIR and two other Islamic organizations as “unindicted co-conspirators and/or joint venturers” in a criminal conspiracy to financially support Hamas in United States vs Holy Land Foundation. Omar Ahmad, founder of the Council on American Islamic Relations, told a Muslim crowd "Islam isn't in America to be equal to any other faiths, but to become dominant. The Koran, the Muslim book of scripture, should be the highest authority in America, and Islam the only accepted religion on Earth." At the Islamic Association of Palestine’s third annual convention in Chicago in November 1999, Omar Ahmad gave a speech at a youth session praising suicide bombers who kill themselves for Islam. "Fighting for freedom, fighting for Islam — that is not suicide. They kill themselves for Islam," he said. Nihad Awad, CAIR Executive Director, said "I am in support of the Hamas" movement. Mustafa Carroll, executive director of the Dallas-Fort Worth CAIR branch, told a crowd at a Muslim rally in Austin, Texas in 2013 "If we are practicing Muslims, we are above the law of the land." Mousa Abu Marzook, a former CAIR official, was designated by the U.S. government in 1995 as a “terrorist and Hamas leader.” He now is a Hamas leader in Syria. Siraj Wahhaj, CAIR’s advisory board member, was named as one of the "unindicted persons who may be alleged as co-conspirators" in the attempt to blow up New York City monuments. Muthanna Al-Hanooti, 48, the former head of CAIR's Michigan branch, was arrested in 2008 at the Detroit Metropolitan Airport on return from the Middle East. The 14-page indictment presents five counts against him: conspiring to act as an agent of the Iraqi government, violating the International Emergency Economic Powers Act, and three false statements to the FBI. The indictment also alleges that "on or about December 22, 2002, the Vice President of Iraq directed the Iraqi Ministry of Petroleum to allocate to defendant AL-HANOOTI a quantity of two million barrels of oil" that he could then sell. In brief, he stands accused of being a spy for Saddam Hussein's government. More information. Nabil Sadoun of Dallas, a former CAIR board member, was deported from the United States on the orders of Judge Anthony Rogers of the Executive Office for Immigration Review in connection with U.S. government accusations that he had ties to terrorist groups. US. Court of Appeals rules CAIR national must stand trial for massive fraud, RICO. The Council on American Islamic Relations is now charged with fraud and cover up perpetrated against hundreds of victims. The Council on American Islamic Relations (CAIR) will stand trial on charges of fraud and cover up for alleged crimes perpetrated against hundreds of victims, according to a new ruling by the U.S. Court of Appeals for the District of Columbia. CAIR Florida’s 2016 fundraiser featured two terror linked speakers, Hatem Naji Fariz and Siraj Wahhaj. Hatem Naji Fariz is the Manager of the al-Qassam Mosque a.k.a. Islamic Community of Tampa (ICT). Al-Qassam was established by Palestinian Islamic Jihad (PIJ) leader Sami al-Arian and named after Izzedin al-Qassam, the individual who was the inspiration for PIJ’s founding. Siraj Wahhaj’s terror link is reported above. Ahmed Bedier, as director of the Tampa office of the Council on Islamic-American Relations defended Sami Al Arian, who was indicted and pled to federal charges of raising support for a Palestinian terrorist organization. Ahmed Bedier also spoke on behalf of Youssef Megahed, one of two University of South Florida students who were arrested for allegedly carrying pipe bombs near the naval base in Goose Creek, S.C. Megahed was arrested later for deportation. The Tampa Tribune reported the following on April 15, 2006 regarding Bedier’s defense of Sami Al Arian: “Ahmed Bedier, Tampa spokesman for the Council on American Islamic Relations, said Moffitt was wrong about the Al-Arian plea. Al-Arian did not agree to admit to any charges associated with terrorism, Bedier said ‘He (Sami Al Arian) stayed true to his convictions - he stayed true he wasn't going to plead to those issues,’ Bedier said. ‘There is no conspiracy to support terrorism.’” The Tampa Tribune reported the following on September 1, 2007 regarding Bedier’s defense of the Goose Creek suspects: "We have faith in the American judicial system," said Ahmed Bedier, executive director of the Tampa chapter of the Council on American Islamic Relations. "So far we've only heard and read about vague language describing an explosive device, but no actual evidence. Until that's displayed it's going to be unclear what's going on." CAIR sent out a press announcement on April 7, 2015 applauding Iowa's failure to pass legislation that would have banned Sharia law in their state courts. Sharia law is antithetical to the rights and liberties afforded under the United States Constitution. “In 2008, the FBI developed a policy on its interactions with CAIR based in part on evidence presented during the 2007 trial of the Holy Land Foundation for Relief and Development. 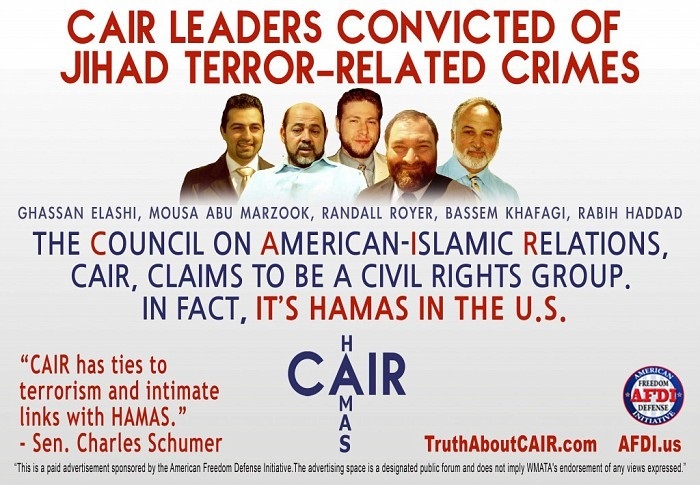 The evidence at trial linked CAIR leaders to Hamas, a specially designated terrorist organization, and CAIR was named as an unindicted co-conspirator in the case. The policy was intended to significantly restrict the FBI's non-investigative interactions with CAIR and to prevent CAIR from publicly exploiting such contacts with the FBI.” Office of the Inspector General. In September 2013 the Office of the Inspector General audit of the FBI stated in part: "the FBI needs to ensure that all appropriate personnel at Headquarters, particularly OPA and - and in the field offices are fully briefed on the requirement to coordinate with one another. The FBI's re-promulgation of the rule reflects its belief that specific considerations still require that non-investigative interactions with CAIR be restricted on an ongoing basis. Office of the Inspector General report page 36 of 41. – represent redacted information.